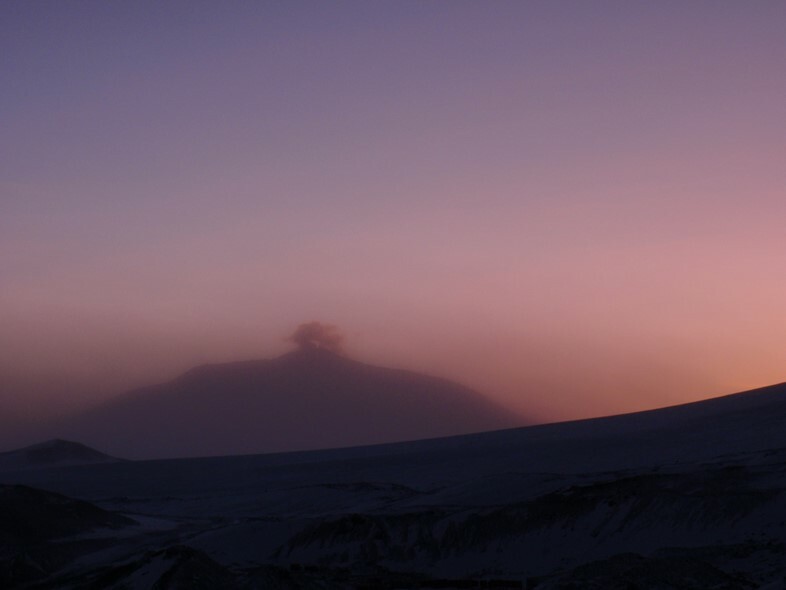 Rising thousands of metres above Ross Island in Antarctica, the fiery caldera of Mount Erebus tops one of the world’s most remote and spectacular volcanos. Continually active since it was first discovered, it is one of just five persistent lava lakes on our planet, alongside Mount Nyiragongo and others in the South Pacific, Africa and Hawaii. 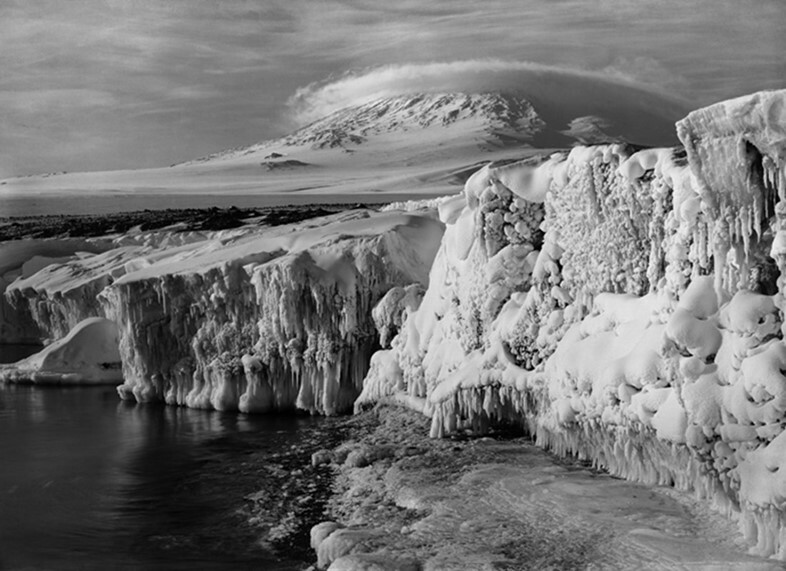 Unlike its cousins, Erebus is perpetually blanketed in snow and ice, creating a surreal contrast as steam and smoke rise above the empty Antarctic whiteness beyond. Fittingly, Erebus is the primordial Greek deity of darkness, but the volcano is actually named after one of the ships that first carried its discoverer, Sir James Clark Ross, to Antarctica in the 1840s. Visible from the sea, it must have been an imposing sight for early explorers – a towering presence perched at the very edge of the vast unknown. In the decades that followed, climbers, geologists and volcanologists made trips to its challenging summit first to explore and later to study this incredible natural wonder. 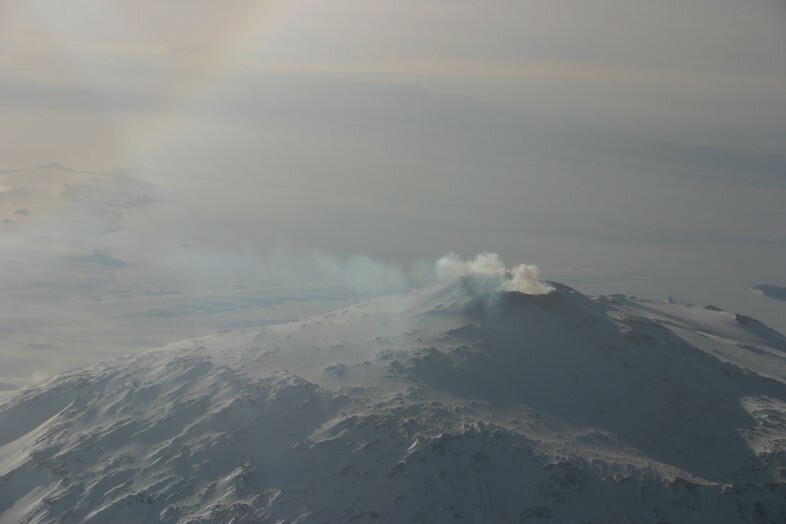 Mount Erebus is a polygenetic stratovolcano located above a 160-190 mile wide hotspot that descends 370 miles below the surface of the Earth. Beyond its forbidding crater lake, Erebus (also the name for the “place of darkness between Earth and Hades” in ancient Greece) is home to a surreal landscape riven with crevasses, ice caves and dark tunnels leading towards the geologic underworld. 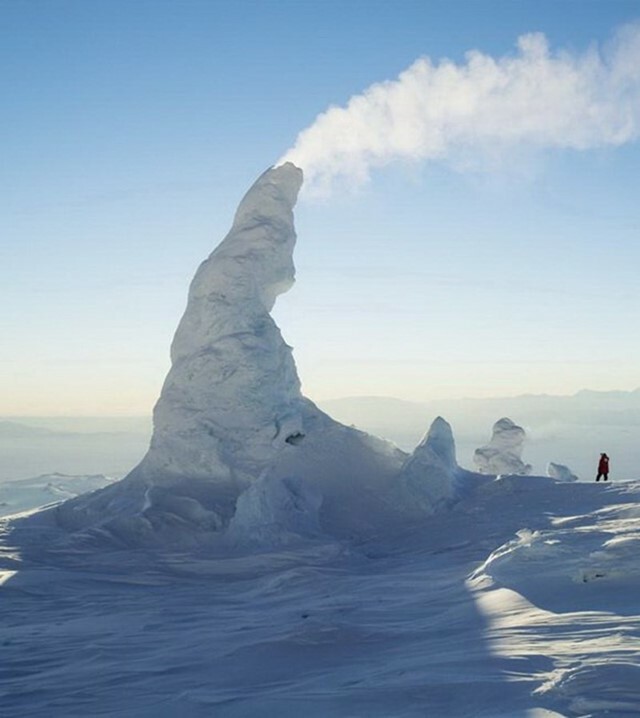 On the surface, fumaroles vent steam and gases from within, creating towering ice formations that rise from the snow and rock. Shrouded in perpetual darkness a third of the year, it’s like something out of myth – a vast and foreboding world. 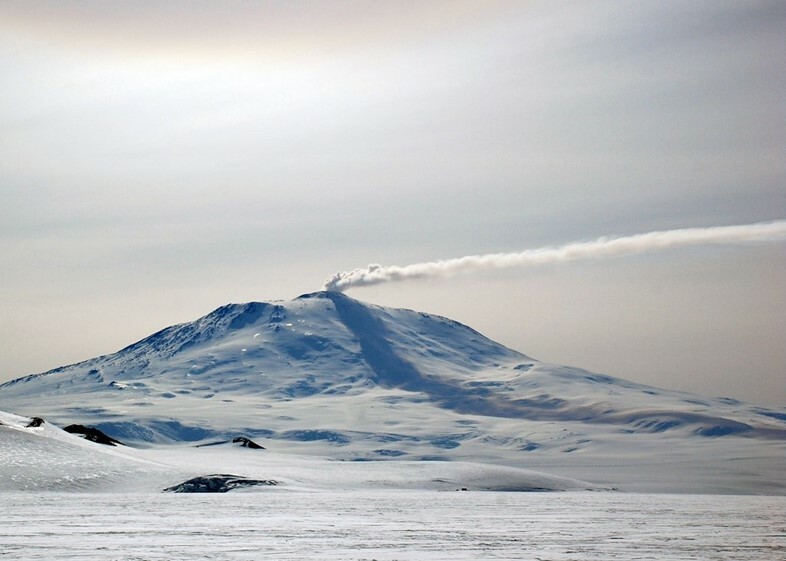 Scientifically, Mount Erebus is an incredibly unique and valuable place. Its steady, stable eruption allows volcanologists to examine the caldera, monitor volcanic activity and map the subsurface structures up close, while the ice caves offer us clues to what life on other worlds might be like. Inside these cold, dark spaces – cut off from the rest of the world – astrobiologists can study the rare bacteria and fungi that survive in these most inhospitable of environments. With no other animals – or people – to disturb the pristine, varied conditions, the flanks of Erebus offer scientists the perfect laboratory. 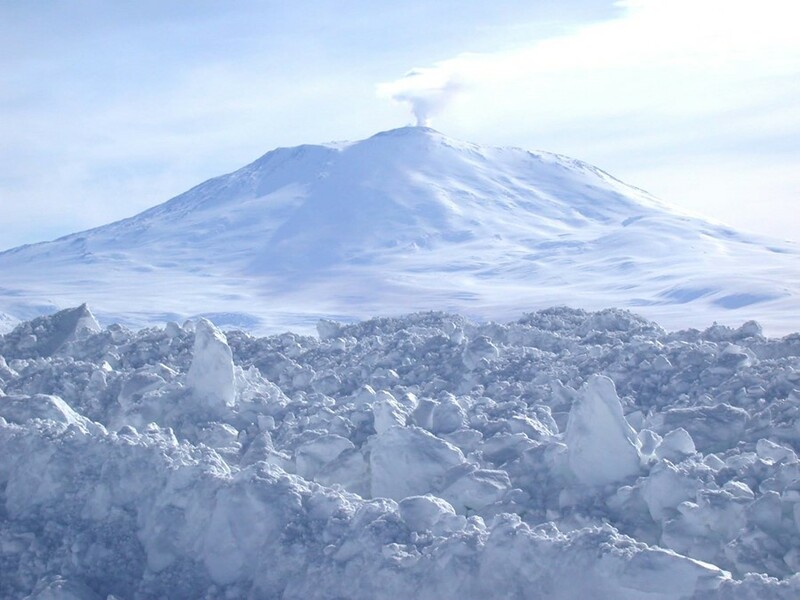 Climbing Mount Erebus is possible in the summer months, but it’s not the easiest place in the world to get to. If you’re not a researcher or government official, visit the New Zealand government’s page to plan an expedition. Seeing it from afar is a little easier – Antarctica Bound has cruises visiting the Ross Sea region while Antarctica Flights offers sightseeing aboard a Qantas 747, which also cruises over the South Pole.